What happens when you put the best parts of Indiana Jones and Lara Croft together then mix them up with a little bit of Modesty Blaise? Answer, you get Percival Constantine’s coolest new pulp hero, Elisa Hill. From the opening action sequence to the last climatic battle with a cruel and vicious assassin, “The Myth Hunter” is a super charged thriller that never lets up. Even when dealing with exposition scenes, Constantine shines in this adventure. His writing has matured greatly since his last book and “The Myth Hunter” captures the reader’s interest with a fluid ease of storytelling that is both polished and suspenseful. Learning that a little is often better than more, he gives us bits and pieces of Elisa’s past, when she was a mercenary tomb raider, seeking out the world’s ancient treasures solely for personal gains. Yet somewhere along the way, echoes from her parents’ teachings take root and she learns to value the non material treasures of the world, particularly honor, loyalty and courage. Now she is out to discover the secret to the whereabouts of the fable lost Lemuria with the help of her university allies and a truly bizarre Japanese changeling. But there are also dark forces gathered against her such as the secret society known as the Order and their roguish agent, Lucas Davalos. Davalos and Elisa were once partners, now they are on opposite sides and a victory for one could mean death to the other. 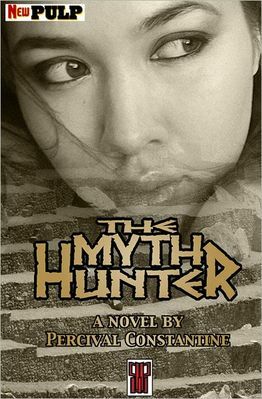 “The Myth Hunter” is a solid, masterful thriller by a young writer realizing his tremendous potential. Another publishing note, “The Myth Hunter” is the first book from any publisher to bear the New Pulp logo brand signifying a very exciting movement in the field. Based on the classics of old, new pulp thrillers like “The Myth Hunter” are blazing into the future to thrill and excite an entire new generation of readers. Isn’t it time you bought a ticket on this train? You realize there are books reviewers are predisposed to like by the title alone. When the good folks at the New York Journal of Books offered to send me this book, it was because I’d already reviewed an earlier book by the same author and liked it a great deal. But being brutally honest here, I’d forgotten what that title was until they showed me the cover image to “Blood of the Reich.” Ah, yes, William Dietrich, I thought, the fellow who created that Revolutionary version of Indiana Jones in his first book, “Napoleon’s Hero.” Yes, I had enjoyed that historical romp and was curious as to what this new stand alone offering might contain in the way of a fun reading experience. Once I read the marketing copy, I was hooked. Nazis scientists racing to Tibet in hopes of finding a hidden mystical power in the lost city of Shambhala. These plot elements scream pulp pleasure and I knew immediately this was my kind of book. Dietrich’s background as a naturalist and historian allow him to create outlandish plots against authentic, real world settings and it is that richness of historical data that catapults “Blood of the Reich” into action from page one. In 1938 Kurt Raeder, a German archeologist, is given an assignment by Hitler’s personal advisor, SS Chief Heinrich Himmler. Raeder and a handful of loyal Nazis scientists are to travel to Tibet, seek out the lost city of Shambhala and there retrieve an ancient power known as Vril. Himmler and the members of the arcane Thule Society believe this Vril could tip the balance of the coming war in Germany’s favor and fulfill Hitler’s mad dreams of a Third Reich world conquest. Raeder is an intellectual sadist and the temptation to achieve personal glory, maybe even immortality, through the success of such an undertaking is much too great for him to resist. And so the mission is launched. At the same time, American intelligence agencies discover Raeder’s purpose and recruit their own academic agent, zoologist Benjamin Hood, to go after the Nazis and beat them at their own game. Failing that, he is to sabotage their efforts and assure Vril never becomes a German weapon. Now this rollicking race across the world is exciting enough but Deitrich ups the ante by creating a second storyline; this one taking place today. Rominy Pickett is a computer publicist living in Seattle when she is kidnapped by a mysterious, handsome journalist, who claims her life is in danger from Neo-Nazis. They believe her to be the great granddaughter of Benjamin Hood. These want-to-be Nazis have uncovered the records of Raeder’s Tibetan mission and hope Rominy will lead them to rediscover what was found in those rugged mountains back in 1938. Thus is a smart, witty, normal young woman suddenly hurled head first into a life-or-death race around the globe accompanied by a charismatic stranger who appears to be a physical embodiment of all her romantic fantasies. But is he really her knight-in-shining armor or someone with ulterior motives using her to achieve his own dark agenda? “Blood of the Reich” is a barn-storming novel that sets its sights high and never fails to deliver on them. My singular criticism is that the convoluted mystery of Rominy’s past and her evolution from frightened victim to pistol toting survivalist challenged even my willing suspension of disbelief. Deitrich’s prose is much more accomplished when dealing with the 30s whereas his modern sequences aren’t as assured. Still, this book has so much pulp goodness within its pages, I can’t help but recommend it enthusiastically. It would make one hell of a great film. Since creating their unique modern pulp hero, FBI Special Agent Pendergast, writers Douglas Preston and Lincoln Child have miserly doled out small pieces of his background history. The highlight of which seemed to be the monumental trilogy that depicted the battle with his demented brother, Diogenes. Still there remains missing elements and with FEVER DREAM, the tenth book in the series, the pair once again sets about filling in those pieces. At the offset we are introduced to Helen Esterhazy, the beautiful and brilliant woman who would be Mrs. Pendergast for an all too brief time only to die in a horrible hunting accident while on safari in Africa. Now, twelve years after that tragic event, Pendergast uncovers irrefutable evidence that Helen’s death was not an accident but murder, the result of a well orchestrated scheme but a merciless killer. 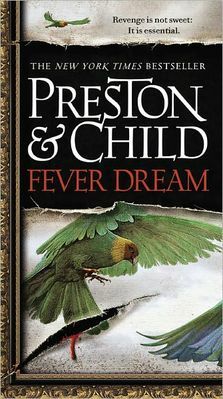 A man of obsessive passions, once this information comes to light, Pendergast becomes a living dynamo set upon a singular quest; to discover the murderers and wreak his vengeance upon them. To accomplish this, he recruits his long time friend and ally, New York police detective, Vincent D’Agosta much to the frustration of the cop’s lover, Chief Laura Hayward. Hayward doesn’t trust Pendergast because of his unorthodox methods and is forever worried his recklessness will jeopardize D’Agosta career or worse, get him killed. This time her fears are almost realized as the pair begin traveling the globe unaware their inquiries into this decades old mystery has made them the targets of a ruthless, professional killer. The non-stop action moves from the African bush to the bayou swamplands of the south making FEVER DREAM another solid entry into what has become this reviewer’s favorite modern pulp series. As I’ve always preferred paperback editions to the hardbacks, my apologies for these reviews being somewhat late. If you love great characters and truly bizarre story plots, the Special Agent Pendergast books should be on your must-read list. Believe me, you will not be disappointed. Last year William Speir introduced the world to a super secret organization known as the Knights of the Saltier; a group of patriotic men and women dedicated to helping the legal authorities of the world maintain law and order. Into this highly complex organization he set his protagonist, Tom Anderson, a former military officer looking to find meaning in his life beyond the normal goals of career and monetary success. By the end of that first volume, Anderson had joined the Knights and discovered his own father was one of the Grand Masters. At the time I reviewed KNIGHTS OF THE SALTIER, I made a point of applauding it’s originality in giving pulp fans something new and fresh. Whereas with this second entry in the saga, Speir has inadvertently gone down a very popular plot path considered to be one of the most remembered in the history of the genre. In 1934 Popular Publications launched OPERATOR 5, the adventures of a Secret Service agent named Jimmy Christopher. The stories were penned by veteran pulp scribes Frederick C. Davis and Paul Tepperman. Tepperman was responsible for the 13 interconnected novels that make up The Purple Invasion, a series in which the Purple Empire (an unnamed European power) conquers the United States after conquering the rest of the world. Jimmy then led the insurgency against them. The saga is often referred to as the War and Peace of pulps. In CRUSADERS OF SALTIER, Speir has America conquered but not from an outside force. Rather it is seized from within by a corrupt Washington Administration led by a megalomaniac President set on a course of tyranny and using his power to illegally circumvent the Constitution. When dissenting Americans begin mysteriously disappearing without due process, the Knights of Saltier must confront their greatest challenge ever, how to battle corrupt government agencies and restore the country to the rightful rule of the people. This is an intense thriller with a fascinating, and very chilling plot line, extremely well realized. Speir balances the action sequences with the more mundane occurrences in Anderson’s life, ala his meeting a lovely young woman and falling in love all the while caught up in the Knights’ struggles to save the government. His skills as a storyteller are growing exponentially with each new book. Once again I heartily recommend this to pulp fans looking for a new twist on action-adventure prose. 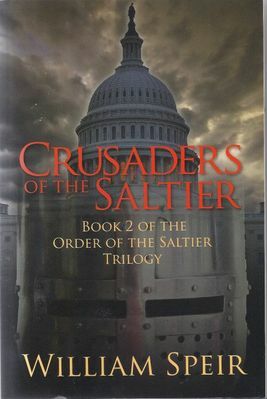 CRUSDAERS OF THE SALTIER is a terrific chapter in a truly excellent series. 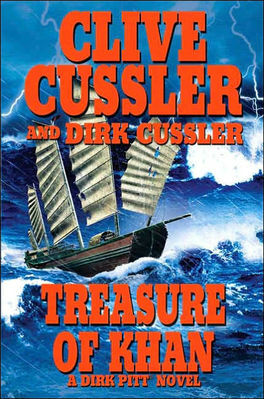 In this, the 19th book in the Dirk Pitt adventure series, the head of Numa and his loyal sidekick, Al Giordano find themselves in the wilds of Mongolia battling a descendant of the world conqueror Genghis Khan who has harnessed a machine capable of creating earthquakes. These he uses to disrupt the world’s fuel distribution. Once again, Cussler’s modern day pulp hero faces overwhelming obstacles to thwart the villain and in the end discover the long lost graves of both Genghis and Kublai Khan. This is the second Pitt adventure Cussler has co-written with his son Dirk and comforts a legion of fans in knowing the character will most likely continue long after his creator had retired. For those who believe the pulps died out long ago, pick up any Dirk Pitt title and get ready for a truly amazing ride. This little book is such a breath of fresh air, I was delighted with it from page one to the end. Many of today’s action thrillers take themselves way too seriously. Actor, writer Stephen Jared knows how to blend slapstick with flying fists and this adventure truly has the feel and charm of an Indiana Jones flick. The hero is Jack Hunter, known around the world for starring in B-Movie actioners. He’s on his way to South America to film yet another jungle potboiler and everything seems routine. Even better, aboard his chartered flight is a gorgeous animal trainer named Maxine “Max” Daniels accompanied by her orphaned niece and nephew, Lindy & Tyler. But when the pilot has a heart attack and the plane goes down in the Ecuadorian wilderness, Jack quickly learns everything isn’t exactly like a movie script. Jack, Max, the kids and tag-along co-pilot Clancy, have to brave wild animals and savage head-hunters to survive their all too real ordeal and along the way, Jack learns what it is to be a real hero, to put others before his own interests and to discover the meaning of true love. 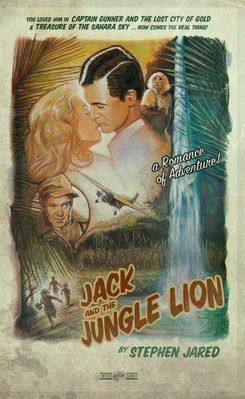 JACK AND THE JUNGLE LION may not win any literary awards, but it’s amusing, rollicking tale will make you nostalgic for the old days of glitzy Hollywood when fantasy and reality where often too close to tell apart. Pick this book up, it’s just plain fun.